If you ever have seen strawberry guava trees in Thailand or Laos you are an exception, they are widely unknown here. The Psidium cattleyanum trees originated in Brazil and are close relatives of the common guava, even though their leaves look completely different. 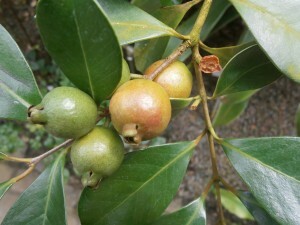 The small red fruits are not bigger than the egg of a dove, but look exactly like the common guava. The cherry guava fruits can be eaten with their skin and taste like a mix of sweet strawberry and passion fruits. 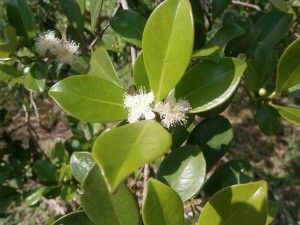 In Thailand and Laos the cherry guava trees start blossoming in the middle of October, after some of the last heavy rains of the rainy season. 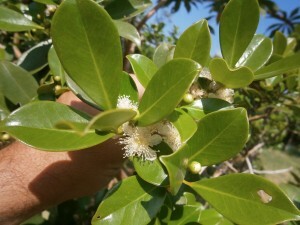 The strawberry guava trees grow quickly after the age of three years, bear a lot of flowers and later a lot of the tasty and pretty fruits. Our strawberry guava trees at Discovery Garden Pattaya and Nong Khai are first green and become red when they mature. There seems to be another variety that turns yellow when ripe, but so far we have not found it yet. 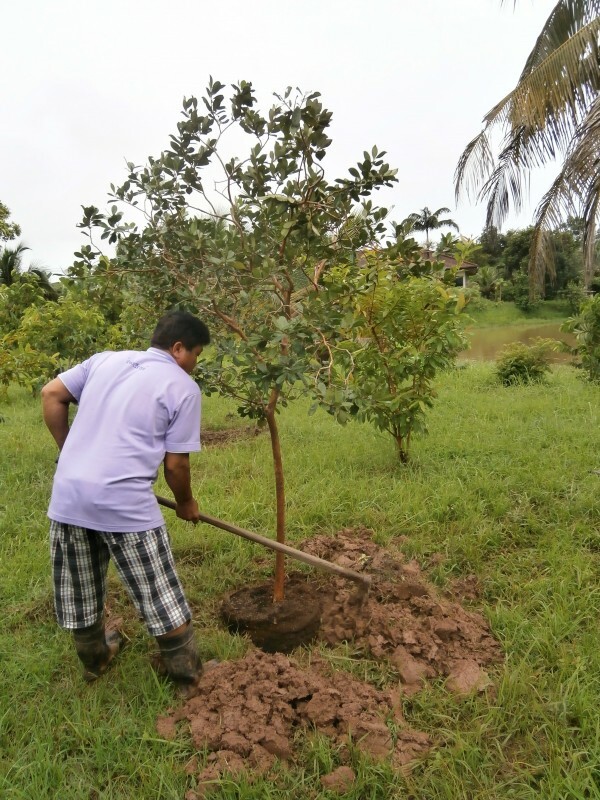 The advantage of planting already mature strawberry guava trees is obvious: You can harvest your first and tasty cherry guava fruits in no time. I have a garden near Petchabun.which has various growing niches, and I am keen to add to my collection of edible fruit and spice plants. My friend has a larger garden near Khao Yai. I will contact you when we are free to visit together. Do you grow red grapefruit or the yellow tropical raspberry (maybe from Queensland) ? Sorry, no grapefruit orb yellow raspberry…but would like to have those…. 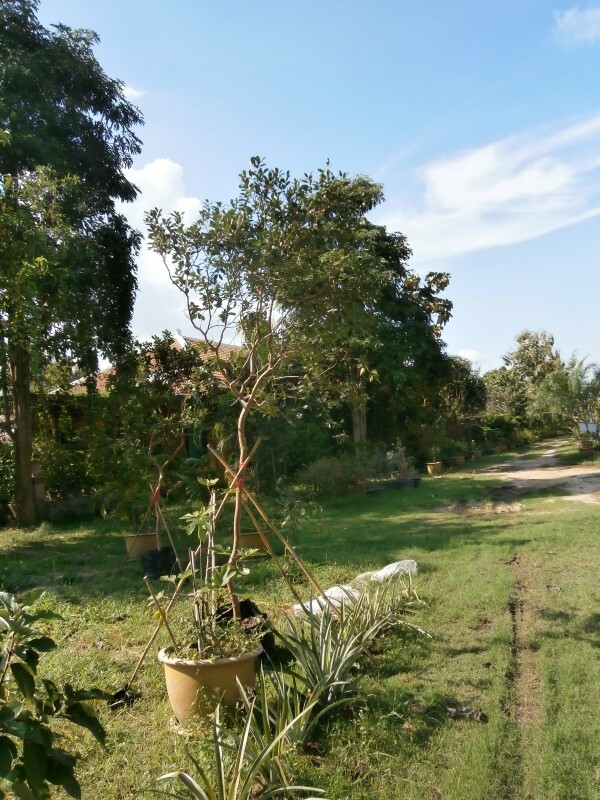 We bought recently 2 Strawberry Guavas and potted them in bigger pots to prepare the roots for their final place on our Land. I can confirm that the Strawberry Guava has its name to right. The taste is absolute delicious and has 100% Strawberry taste. If they wouldn’t have larger seeds as a Strawberry there will be no difference. Even in the new pots they are just exploding with fruits much to the pleasure of my wife who loves Strawberries over all. The plants are well grown and very healthy, good job Hans, it is a pleasure to see all Trees I bought getting already new leaves and made a couple of inches in their new pots. @ Alan: I have bought some Red Pummelos at Chatuchak market in Bangkok and got told that the Ruby red Grapefruit is very hard to keep in Land of Smile, neither they will bear juicy fruits. Thanks a lot for your kind words. We love happy customers.